Secy. of the Woodland Cemetery Assn. Woodland was incorporated as a town on March 5, l880, the name being descriptive of a land abounding in wood. The naming Woodland from No. 14 Township was said to have been by Mrs. J.G. Thayer and her daughter Percees, at a regular town meeting. The town was first surveyed by Edwin C. Burleigh on November 28, 1877 and found to include 34,102 square miles. The schoolhouse was built in 1895 by carpenter and school teacher David Snowman and was named the Snowman Schoolhouse after him. He was assisted with the schoolhouse project by his two sons, Walter and George Snowman. David Snowman also served as one of the town's selectmen, served as Superintendent of schools and other civil affairs of the town. He was the last remaining veteran of the Civil War in Aroostook County. 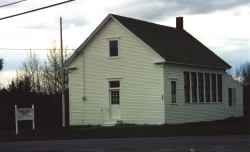 The Snowman School house has historical importance as it is the only original one-room school house left in the community. Other one-room school houses have either been torn down or converted into garages or homes. The School house has been kept in its original state of past years including the box type stove in the center of the room. The museum has antiques and historical items donated by townspeople and others. Carl Lagerstrom, Sr. and Emma Hallstrom were married November 3, 1903 in Caribou. Mildred Lagerstrom was born in the house on December 10, 1904 and Carl Lagerstrom was born in the house on April 21, 1908. Carl and Emma lived in the house till about 1943, then they would spend the winters at their son's home in Caribou. Carl Lagerstrom, Sr. died August 12, 1947 on his 86th birthday. His wife Emma died May 28th, 1950 at the age of 80. After their parents died, Carl Lagerstrom gave his half of the property to his sister, Mildred. Mildred who worked in Boston, Massachusetts, would live in the house during part of the summer until 1985. The barn was torn down in the 1950's. The property was purchased from Mildred by her niece and nephew, Priscilla Lagerstrom Walther and John Lagerstrom on November 17, 1994. 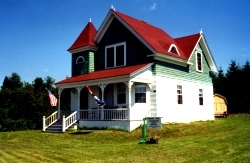 The property was donated to the Woodland Historical Society by Priscilla Lagerstrom Walther and John Lagerstrom in memory of their grandparents, Carl and Emma Lagerstrom, on October 29, 1996. The Snowman Schoolhouse is open to the public, Sundays 1 - 4 p.m starting Memorial weekend and throughout June. After that by appointment. For more information or to visit these historical buildings, please contact one of these gracious volunteers. Making a commitment to recycle could save you and your community money. Each Maine resident generates about a half ton of trash every year. Woodland's solid waste goes to the Tri-Community Recycling & Sanitary Landfill. Our town does not give out stickers for the landfill, because we are not one of the original of the three communities that got together and started the landfill. We have 5 recycle igloos for our residents located at the Woodland Town Office. Captured in the glory of summer, this old Seed Potato truck belongs to a resident of Woodland. 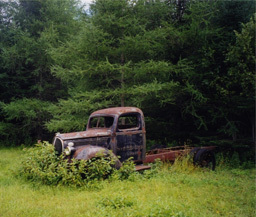 The owner believes that the year of this old Ford truck is somewhere between 1938-1940. Can you guess who this belongs to?